There is nothing more heartbreaking than the death of a loved one. Once it happens, families and friends are left with the difficult task of dealing with their loss. Even though a death can be hard for surviving friends and family, it’s important to take time to say goodbye, says Paul Lizer, funeral director at Delehanty Funeral Home, 401 River Lane, Loves Park. He wants each funeral or memorial service to be as special and unique as the person being remembered. After working with grieving families for the past 33 years, Lizer has learned that people who don’t go through with a funeral regret that decision later in life. He believes too many people are using cremation as a way to avoid dealing with feelings of grief and loss. “There’s nothing wrong with cremation itself because it’s just a form of disposition,” Lizer says. The problem comes when people opt not to have a service or event of some kind to acknowledge the loss and say goodbye. Lizer compares not saying goodbye with a funeral to not saying goodbye to a friend when they leave your home. “If you have a friend come over, do you just walk away when the evening ends?” Lizer asks. “That part of enjoying your evening with someone is saying goodbye and it’s no different in life. Lizer’s son, Garrett, an apprentice at the funeral home, says fewer people today want a standard funeral, which focuses more on protocol. They want to celebrate the life of a loved one by making the ceremony personable and light-hearted. In another case, the deceased was a drummer in a band, so his drum kit was set up next to the casket. Those are the types of things the funeral home can help to make possible, says Garrett. Darryl Johnson and his wife Marsha, owners of Sundberg Funeral Home, 215 N. Sixth St., Rockford, have also seen their fair share of personalized funerals. One family brought in bushels of produce to celebrate their loved one, a passionate gardener. Another family rented a city bus to drive to the cemetery, as their loved one had been a bus driver for many years. The personalized touches can help people to honor a loved one properly, Darryl says. There’s not just one way to remember a loved one, Marsha says. And there’s nothing wrong with a traditional funeral. The grief journey is difficult and complicated and Diann Anderson, of Anderson Funeral and Cremation Services, 218 W. Hurlbut Ave., Belvidere, believes in the importance of creating an environment of remembrance. The ceremony and visitation serve different purposes, Anderson says. The visitation is an opportunity for the community to gather with the grieving family. It gives time for friends and family to show their support and love. The ceremony is where we get to share the story of ones life and it’s a time for saying goodbye. Every story is different, every journey is real. Often times, Anderson and her husband, Steve, will also sit down and talk with a grieving family. “We want to make sure this is available to people,” Anderson says. “ We’ll spend time with the family and talk with them and have them tell their story. Sometimes people need to tell their story again and all they want is someone to listen to it. It’s comforting and healing to have someone do that.” Anderson Funeral Home partners with a grief counselor to help families get through the tough times. The staff at Anderson Funeral Home has each experienced a significant loss in their lives. Because of that, Anderson says working in a funeral home has become a calling. Timothy Honquest, funeral director at Honquest Family Funeral Home, 4311 N. Mulford Road, Loves Park, says the number of families who opt for cremation of their loved ones has grown. One of the main reasons for the uptick in cremations is cost. Other factors include out-of-town relatives not being able to attend an immediate service or the false idea that cemeteries are running out of space. Technology has opened the doors for a better-connected world – in life and in times of death. Funeral home websites allow people to research products and services, meet staff, find obituaries and share them, and write sentiments in an online guestbook for the family to treasure. 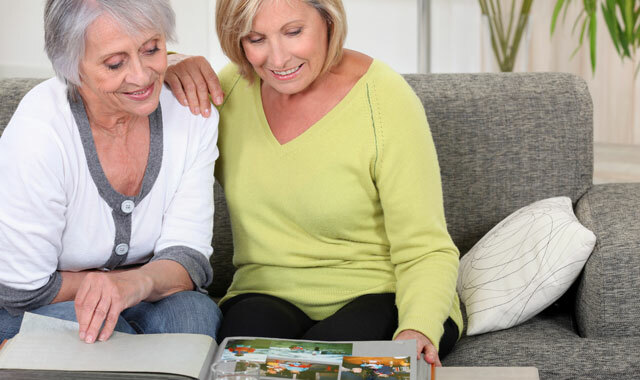 Funeral directors also help family and friends put together memorial DVDs with photos and music that can be shown during the visitation or service; copies can be given to loved ones as a keepsake. Brian McCorkle, owner and funeral director at McCorkle Funeral Home, which has locations in Rockton, Pecatonica and Durand, says preparation helps to make the funeral process less stressful. If a person has pre-arranged and/or pre-paid a funeral, it helps survivors to feel at ease, he says. Getting that conversation off the ground may be easier said than done, however. Many things have changed over the years, but one thing remains the same – the grieving process. Grieving takes time, can’t be hurried, and is as individual as the person feeling the loss. No two people grieve exactly the same and there’s no set order or timeframe in which the job of grieving is fully completed. Flowers have long been an important part of setting the mood at funerals. They bring beauty, comfort and meaning to a funeral or memorial service. They are a physical way many people express their sympathies. Erin Stoffregen, owner of Event Floral, 8181 Starwood Drive, Loves Park, says a funeral arrangement becomes meaningful and personable by the types of flowers used, the color theme, and what personal keepsake items are incorporated, such as a picture, lantern, candle or sports team memorabilia. No matter the funeral, Event Floral aims to create a floral arrangement to fit your needs. Becky Baeverstad, owner of Enders Flowers, 1631 N. Alpine Road., Rockford, says having flowers help lift the spirits of friends and family who are mourning a loss. While you can never go wrong with the flower arrangements for the funeral, Baeverstad says the best ones come with meaning. For example, Baeverstad likes it when customers bring in their own special containers to be filled with flowers. There are many flower choices for the different seasons. Since it’s wintertime, a recent funeral had a casket spray with evergreens, winterberry and pine cones. Sometimes, people come into a flower shop knowing what they want and they know how much money they have budgeted. “Some people come in looking for a standing spray, casket spray or even a plant,” says Michelle Joley, owner of Broadway Florist, which moved from its downtown Rockford location to 4224 Maray Drive about three years ago. In the winter, it’s very common for people to order cemetery pots, wreaths and grave blankets to place on the grave, she says. “It helps the survivors remember their loved ones and flowers are a symbol for all to see that love never dies,” Joley says. There are other times where families don’t know where to start. Joley and her staff are available to help. Laying a loved one to rest can be tough. Fortunately, there are experts in our region that can help guide you through the most difficult time of your life. This entry was posted on Friday, January 13th, 2017 at 5:00 pm	and is filed under Mind & Spirit, Top Posts. You can follow any responses to this entry through the RSS 2.0 feed. Both comments and pings are currently closed.